Click here to read more of the review in the Orchid Digest. A Limited number of the hard-covered edition are still available at $56.95, plus shipping. The Soft Cover edition is available for $39.95, plus shipping. This picture-packed publication chronicles the development of all the major lines of cattleya orchid hybrids in the USA, and explores the contributions of important species to those hybrids. Based on extensive interviews of prominent hybridizers and commercial growers, scientific articles, orchid trade magazines, and by the author's 30+ years of experience growing orchids, this book explains the approach used by American hybridizers during the 20th Century. American Cattleyas is oriented toward all those with an interest in the "Queen of Orchids". 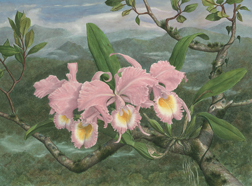 Written by a professor of biology (and orchid fanatic), it is targeted toward the hobbyist in non-technical language, it contains chapters on species that form the basis of modern hybrids, hybridizing strategies, inheritance in cattleyas, culture, exhibiting and judging different hybrid lines, and a glimpse at the many nurseries and individuals that contributed to the rich history of cattleya growing in America. 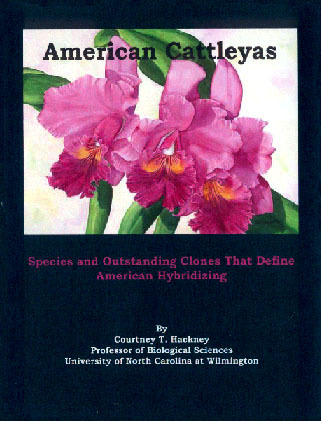 The book follows the development of the major hybrid lines in the Cattleya Alliance, from the foundation species to prominent clones in the background of today’s award winners. The story is pictorially illustrated in a 76 page, stand-alone, color gallery containing 362 photographs. Some of these photographs are over 50 years old while others show the modern culmination of generations of hybridization captured by the latest digital technology. The book is 9" x 11.25". "I truly enjoyed reading it [The Book]. I’m old enough to remember when an orchid corsage was still truly something special, yet not altogether common. Your text makes it clear why and how cattleyas were so important to so many people and you explain who did the work to make them available and beautiful." Mr. Neal Maillet, Executive Editor Timber Press. "I had a marvelous time reading over your book. I think it is a wonderful book full of interesting historical information I was unaware of. I feel that I understand Cattleya hybridization a lot better after reading your book and I bet it will become a classic reference." - William P. Rogerson, AOS judge and recipient of many AOS Awards. "I’m tremendously well impressed with your work! It’s the most thoroughly done material on this subject I’ve ever seen. I can’t wait to get a copy of your finished book." - Mr. Ed Horton, Englewood, CO, noted hybridizer of splash-petaled cattleyas after reviewing a part of the book dealing with splash-petaled or clown-type cattleyas. 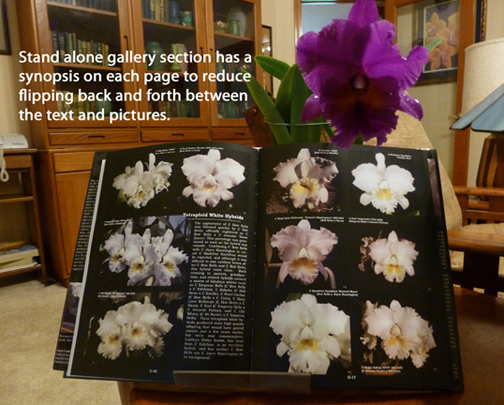 This site features orchid information, including the book, American Cattleyas by Courtney Hackney, Growing /tips (his monthly column), and a list of small numbers of available divsions, stem-props and crosses from the Hackneau Collection. The site also features the art of Rose Ganucheau including original paintings in watercolor and pastel, and limited edition reproductions/prints.